If overripe bananas can’t get me back in the kitchen, I don’t know what can! I am totally out of the habit of cooking and baking. Although we did impose our meal planning and lunch prep on my parents when we lived there, I didn’t do too much of the making of the food. After 2 weeks in Chicago, I am beginning to adjust to my new schedule. I still work 4 long days but now I have Fridays off instead of Mondays. I must say, I liked it best when I had both Fridays and Mondays off this summer, but it was just temporary : ) Fridays off is a bigger change than you think…especially since I’ve been working the same schedule for like 7 or 8 years. It means that my Sundays need to be productive. Ugh! The BOY and I were out late last night at a wedding dancing our hearts out and making new friends. It was a slow start to our day, but we had to shake off the sleep because we were hosting the BOYs aunts for lunch! There was still a bit to do making our house a little neater…you know like piling boxes in the corner. Ha ha! We had a fantastic time showing them our new place and catching up over lunch and tasty food. They left around 3:30pm and the BOY and I decided that we needed an afternoon of lounging around. I don’t think we’ve had a lazy day of TV in a LONG time. I walked over to the grocery store (with my cart) for a few week day essentials and then prepped veggie bags and snacks. 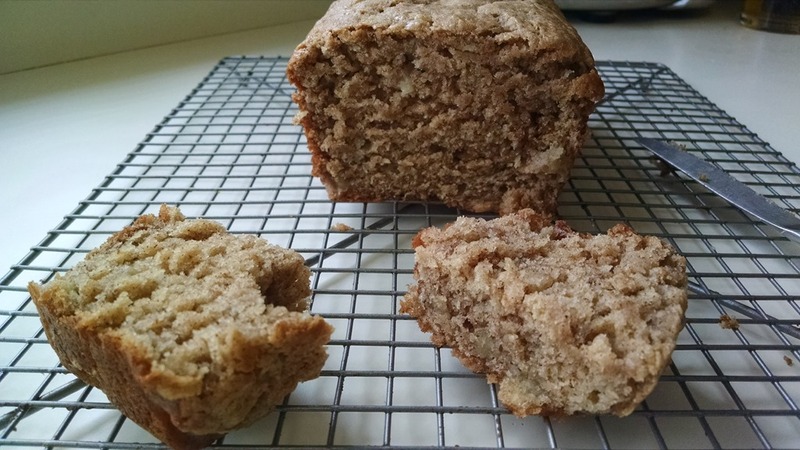 I threw an easy Monday night dinner in the crockpot and turned those overripe bananas into bread. Although I didn’t have much success with the oven on Friday, I wanted to give it another try! I had the bananas but was feeling for a bit of fall, so I chose a banana and pumpkin bread from Skinny Taste. This bread is really soft and delicious and I love the addition of pecans. PERFECT! I am bringing one loaf to work tomorrow and saving the other for our upcoming trip to Door County! Preheat oven to 350°. 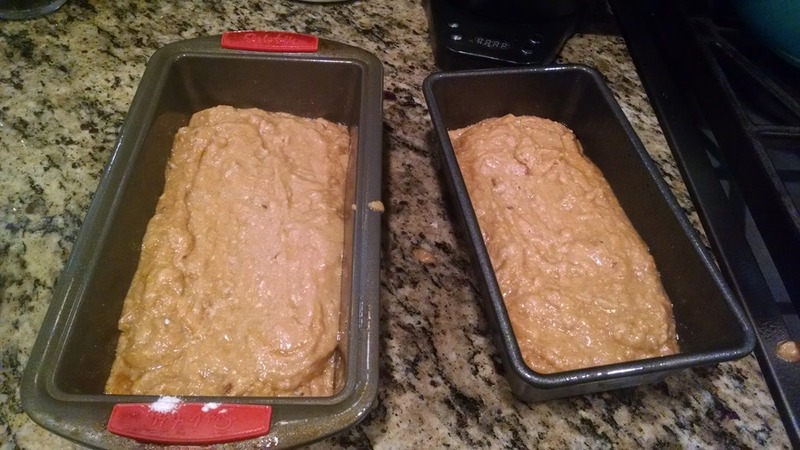 Grease two 8×5 inch loaf pans with baking spray. In a medium bowl, combine flour, baking soda, pumpkin spice, cinnamon and salt with a wire whisk. Set aside. In a large bowl cream butter and sugar with an electric mixer. Add egg whites, pumpkin, bananas, apple sauce and vanilla, and beat at medium speed until thick. Scrape down sides of the bowl. Add flour mixture and pecans, then blend at low speed until combined. Do not over mix. Pour batter into loaf pans and bake on the center rack for 50 minutes, or until a toothpick inserted in the center comes out clean. My office has been rocking the Taco Tuesdays lately! Work is way more fun when you like your coworkers, so I am sad to say that this was our last week together. My bosses offered to throw a potluck in my honor for my last week, and they let me pick the theme, so I went with a summer BBQ. 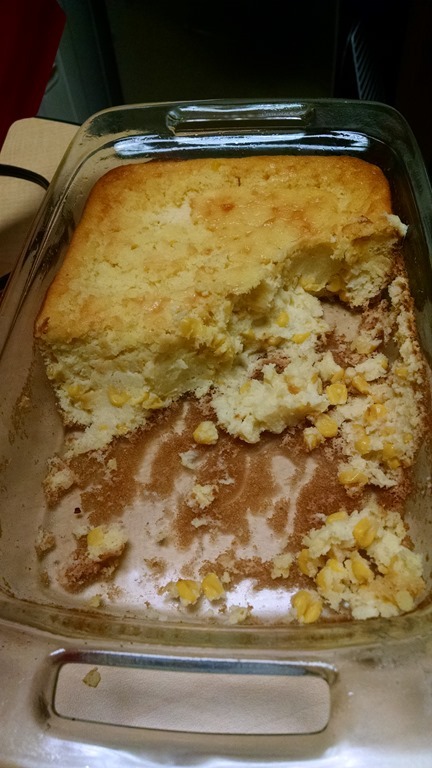 Yesterday, everyone brought something delicious to share, and I signed up for a Corn Spoonbread. It was super easy to make and went perfectly with the BBQ chicken sandwiches! 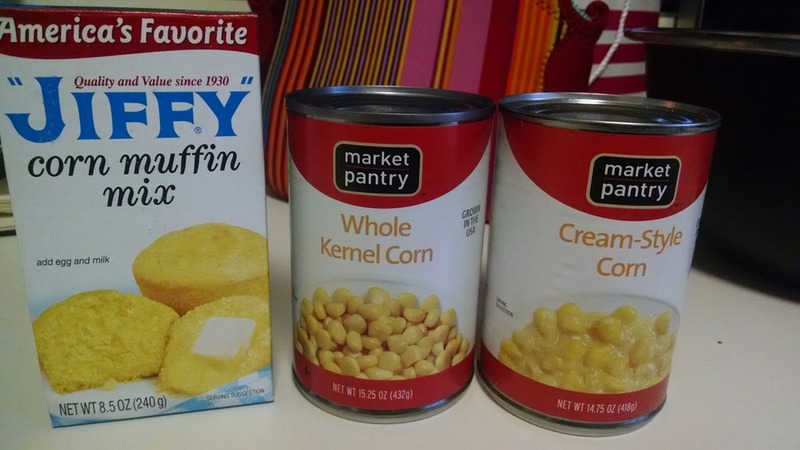 I was a little nervous about serving a new recipe, but how can you go wrong with Jiffy mix and creamed corn?! Luckily, it turned out great (and everyone agreed)! We had more than enough fantastic food to eat, including these incredible desserts made by one of my coworkers! My second to last day went well, and I had mixed emotions about my last day today. All day, my patients (and even some of my coworkers patients) have been so sweet and wonderful! 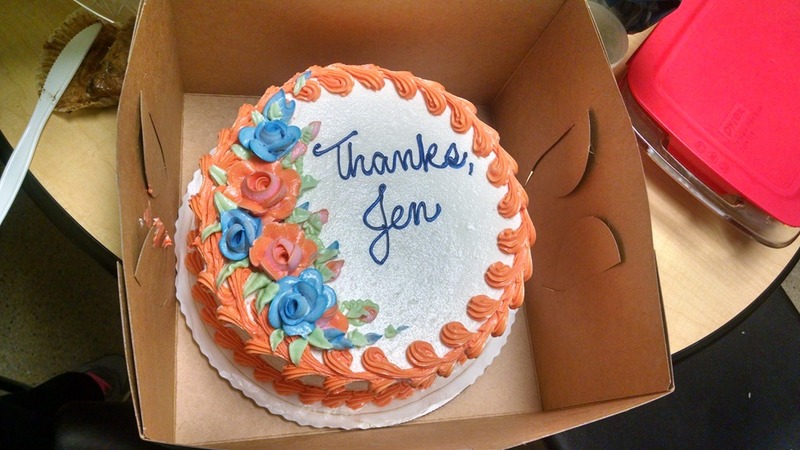 My coworkers are awesome and I know come Tuesday, I will miss them even more! After a long last day of work with tough goodbyes, I swung by Target for some wine, and the BOY and I decided B Wubs would be an easy dinner. 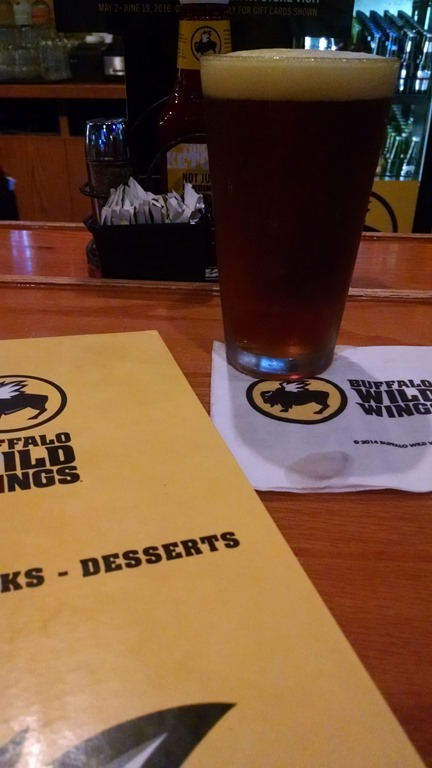 I sipped a beer while I waited for our take out order to be ready. Cooper found the frosting before I even noticed and was happily tasting away. After wings, the BOY and I dug right in too! We then cuddled up for the night with some wine and a movie. Not gonna like…we are watching one of my old school favorites Adventures in Babysitting! It’s a fun way to kick off the holiday weekend, which for me is not only the start of summer, but also a whole new adventure ahead!!! How are you celebrating Memorial Day weekend? I highly recommend that you include this cornbread!!! Preheat the oven to 375° and lightly grease a 2-quart casserole dish with nonstick cooking spray. In a large bowl, combine the ingredients and mix well. Pour the mixture into the casserole dish. Bake 35 to 40 minutes, or until the spoonbread is set. We packed so much into our weekend that it required two blog posts : ) Yesterday I shared Saturday and now it’s on to Sunday Funday! Yes, I know that today is actually Monday! Despite a somewhat late Saturday night, I set my alarm to wake up early Sunday morning for 8am yoga. Two weekends in a row…hooray for me! 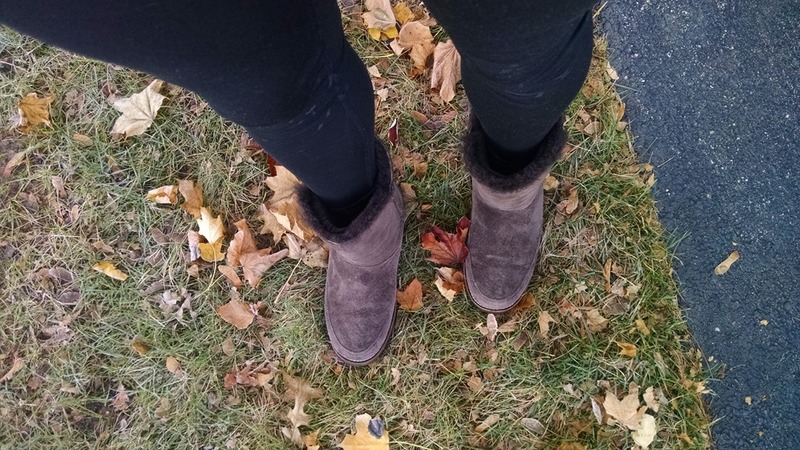 It was so cold (30 degrees) when I woke up that boots and pants were required. And hot tea! I met my mom at the studio with enough time to chat before class. We were pleasantly surprised that the sub was one of our favorite instructors who led us through a deep physical and emotional practice. My legs were sore and tired from Saturdays workout, yet my movement felt effortless. It was an odd sensation but just reinforced how much I LOVE being on my yoga mat, especially when my mom is next to me. After yoga, we went to Whole Foods for coffee, more chatting, and to purchase the ingredients for my Sunday Funday recipe. We had plans with friends of ours for a Sunday lunch. Every time we hang out with them we have a BLAST! I was in charge of an appetizer and wanted to try something new but didn’t have tons of time. 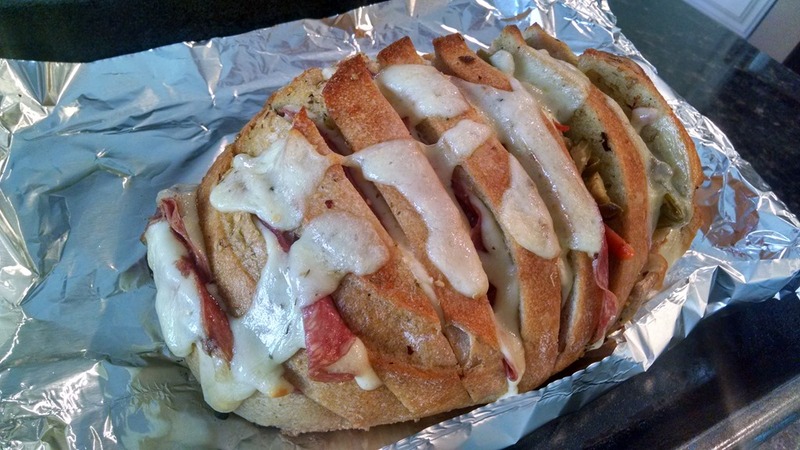 I searched through my Sunday Funday Pinterest Board and after some discussion with the BOY decided on this Cheesy Stuffed Sourdough Loaf. I changed up the recipe a bit and the BOY suggested adding Gardinara, which was a huge success. I had the BOY slice the bread while I whipped together the olive oil mixture. Since we were taking it with us, our plan was to have it all set to go into the oven at our friends house. Then we poured the olive oil mix all over the bread. 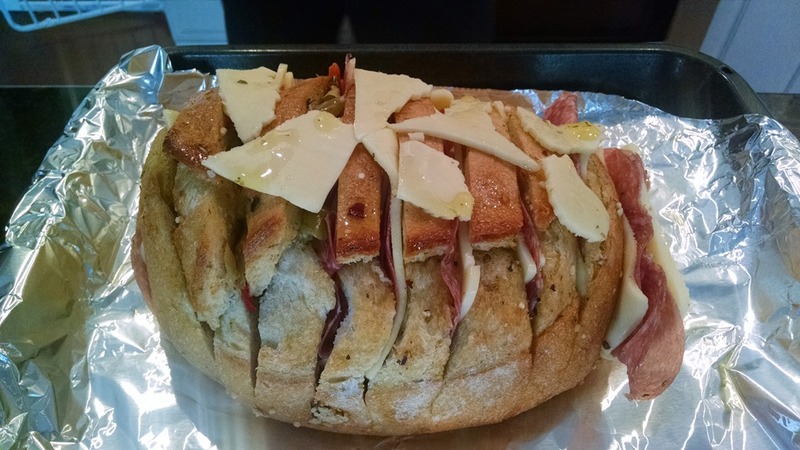 We stuffed each slit with mozzarella cheese and salami and the BOY stuffed half the bread with his Gardinara. We packed it up in a Tuperware for easy transport. When we arrived, we baked up the bread while we poured cocktails and caught up on life. The bread baked for a little over 20 minutes and looked amazing when we pulled it out of the oven. We dove right in before even letting it cool. The warm garlic and olive oil were the perfect compliment to the warm, gooey cheese, and crispy bread. We all raved about how delicious it was, and the BOY took full responsibility for the Gardinara idea. We ate almost the entire loaf of sourdough but tried to save room for our filling lunch of ribs and homemade mashed potatoes. Our friends have two adorable kids who were not napping with all of the excitement of our arrival and food. 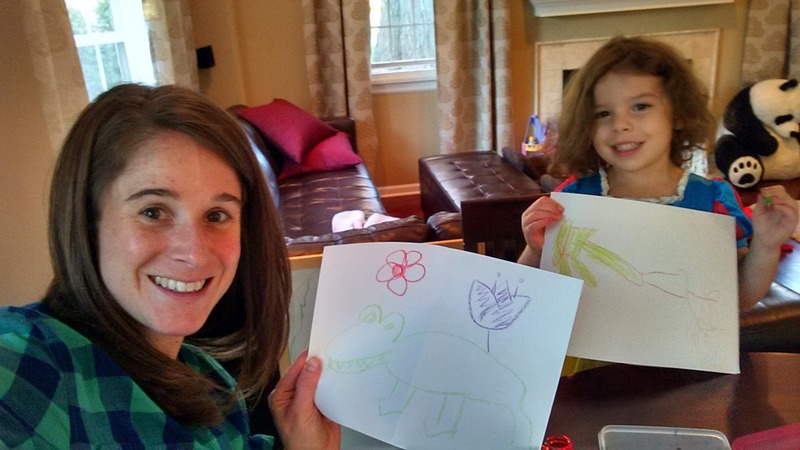 We stayed for hours eating, drinking, coloring, and watching football. Since they weren’t able to make our wedding, there was much to fill them in on and they bought us a gorgeous congratulations cake from the bakery. When we arrived home at 6pm, I was so stuffed, I couldn’t even think about food, but filled with happiness from the ease of a fun day spent with friends. They did send us home with leftovers which I knew we’d be enjoying soon! There was nothing healthy about this bread, but everyone agreed it was a definitely make again! 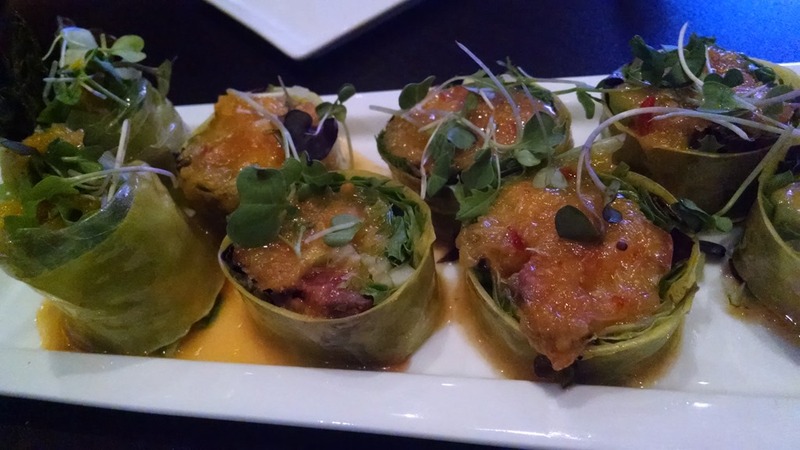 What is your favorite Sunday Funday appetizer? Preheat oven to 350 degrees. Line a baking sheet with parchment paper and place your loaf on the sheet. Slice your round loaf of bread vertically into 3/4″ to 1″ thick slices–but do not slice all the way through to the bottom! (You should end up with about 10 or 11 “slices,” giving you 9 or 10 “slits” to stuff with cheese and meat). In medium bowl, combine olive oil, oregano, pepper, crushed red pepper flakes, and minced garlic, stirring to mix well. Using a pastry brush, brush both sides of all the bread “slices” generously with this olive oil mixture. In assembly-line fashion, make 14 “piles” with each slice of cheese, topped with a thin slice of deli meat. 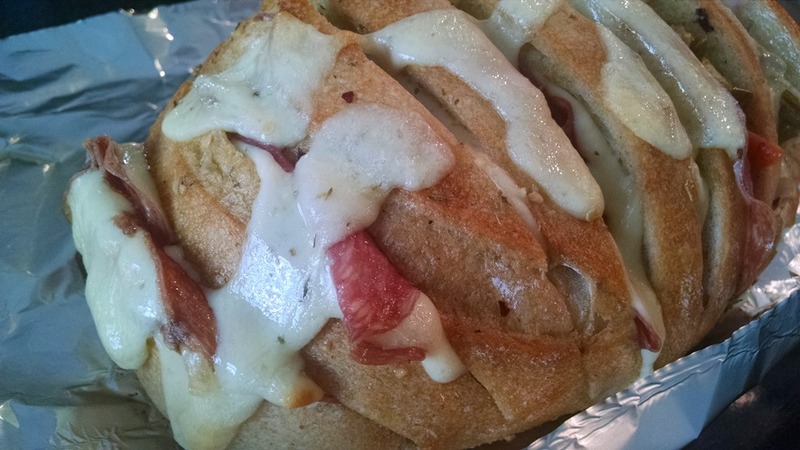 Bend each cheese slice “pile” as if you were going to fold it in half, and fit down in between your bread slices. Because several of the end slices are narrower, one “pile” is enough to fill them up. The wider middle slices will require two “piles” stuffed in between them. Pour in Gardinara generously into slits. Bake your stuffed loaf on the baking sheet at 350 degrees for 20 minutes or until cheese is melted. Remove from oven, and serve while warm! You can just pull the slices apart as you’re eating it, or cut them with a knife. Wow, I’ve been blogging up a storm recently. Are you sick of me yet? We had the most gorgeous 70 degree fall day here! It felt wonderful to be getting back into my no work Monday routine. First stop was the gym for a session with my trainer. Afterwards, I dropped off a car load of household stuff at GoodWill (from our weekend of cleaning) and then went to the grocery store. I made a quick stop at home for a shower and to unload my groceries. Then I was out and about for a few more errands and returns. I ended up at Whole Foods for tasty salad bar lunch. When I got home, I opened all the windows to let in the clean, fresh air, threw in some laundry, and dove into this week’s recipes. We brought a whole bunch of stuff back from Door County including a huge bag of apples. For this reason, my interest was peaked when I found a chili recipe that uses apples. I got all the ingredients at the store and had some fresh cider in the fridge (also from the farm). 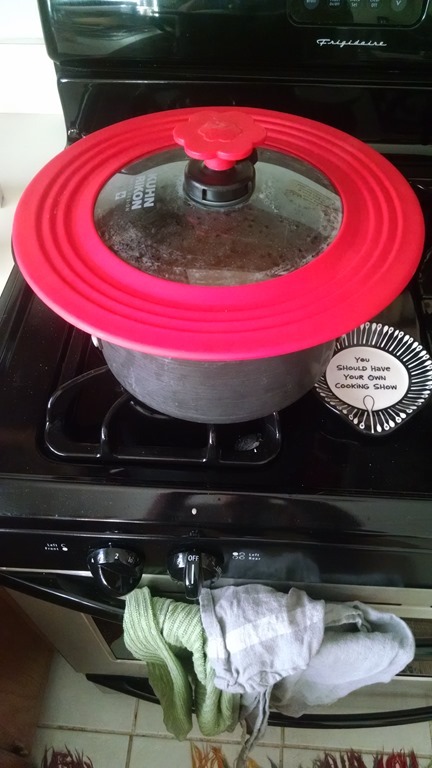 This is a stove top recipe and really quite easy. The flavors are odd but seem to blend together beautifully! Once my chili was simmering, I was ready to make M&M Cookie Bars. I was super sad to discover that I did not read the recipe carefully enough to realize that I needed more oats and two different types of oats. But, I moved on quickly with my softened butter to corn muffins. Only to discover that I bought too small of a package : ( I was having so much fun in the kitchen, between the sun light, clean cabinets, and new wedding gifts that I still wanted to make something. So I cut the recipe in half and turned it into a bread. I left the original recipe for muffins as written below. Just know that you can half it if you buy the tinny 55 cent Jiffy package on accident. I have never made a pumpkin cornbread before, but I loved the idea and the smell. And again as odd as the combinations sound, both worked together to create a delicious meal…for tomorrow night. But I had to try it for a pre dinner snack tonight. The BOY came home to grill, one last time it seems, as the grill ran out of juice. He was able to make dinner in the oven. We’re planning to have the chili tomorrow since we both work later and the rest of the week, I planned out on our newish chalkboard. I’m hoping to have the M&M Cookie Bars made (and shared) sooner rather than later! 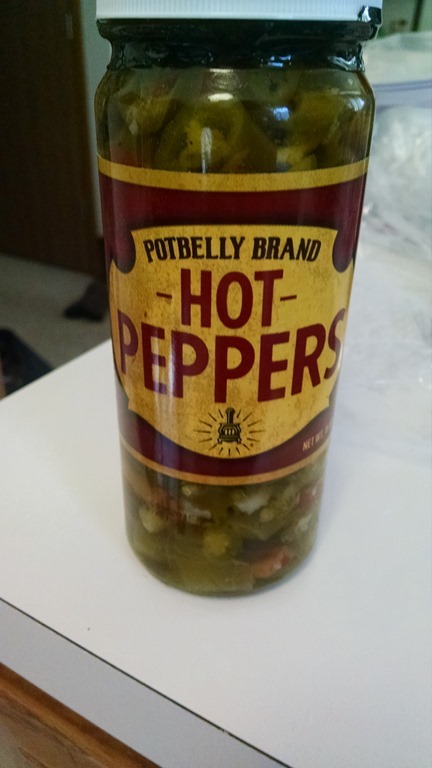 What’s the oddest ingredient you ever added to your chili? *Recipe is mostly the same…I just rewrote it a bit to make it easier to follow! Heat the olive oil in a large dutch oven over medium-high heat. Add the turkey and cook until brown, breaking it into chunks while cooking. Meanwhile, using a food processor, puree the chipotles and 2 tbs of the adobo sauce. Once turkey is browned, drain liquid. Then stir 2 tbs of the chipotle puree into the ground turkey; season with salt and pepper. Reserve the remaining puree to adjust the heat at the end of cooking. Stir in the coriander, cumin, paprika, onion, and garlic. Peel and dice one apple into 1/2″ chunks, add it to the chili. Slice the remaining apple and toss with the lemon juice; Set aside. Add the cinnamon and bay leaves to the chili, cover and cook, stirring and lowering the heat, for 10 minutes. Stir in the tomato paste, then the stock and cider; bring to a boil. Then lower to a simmer for at least 20 minutes and up to an hour. Top the chili with the cheese, reserved apple and the toasted pumpkin seeds if desired. In a large bowl combine the cornbread baking mix, cinnamon, nutmeg and whisk together. Add in canned pumpkin, milk, softened butter, and the egg. Whisk together gently just until combined. Using a large ice cream scoop or spoon, scoop batter and divide evenly into the muffin cups. They will about 2/3-3/4 full. What is one to do two weeks before 15 months of planning finally comes together? 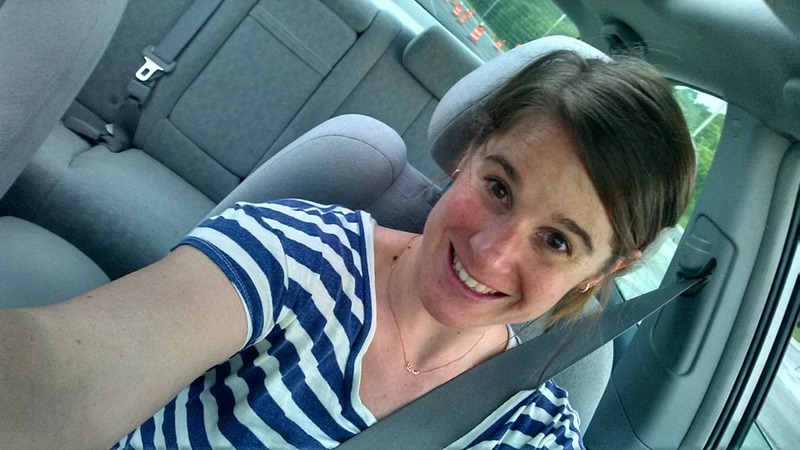 Or should I say…How do you spend your second to last weekend before your wedding? Then we went home for a late dinner and an early-ish bed time. Saturday morning started bright and early with a workout. More kick boxing which should be on every bride’s list of things to do and of course a bunch of pre wedding push ups and sled pulls. Then I was off to teach my kids yoga class. We had a special guest, my friend who just took the Rainbow Kids Yoga class in Chicago and her adorable daughter, who joined us for yoga showing the kids that every body and every age can yoga! From there, I was back home to meet my mom for lunch at our favorite local sandwich place, followed by some wedding related shopping. We lured my sister in law out to the suburbs with the promise of wine and of course a morning espresso from our new machine. I should mention that the BOY, my brother, and a crew of guys were down in Louisville sampling the bourbon and BBQ for the BOY’s bachelor party this weekend. The night began with a cheese plate and pink bubbles (aka rose) and proceeded as expected. We abandoned dinner and sat out back for hours eating cheese and snacks, sharing stories of the past, and making many plans for the future. 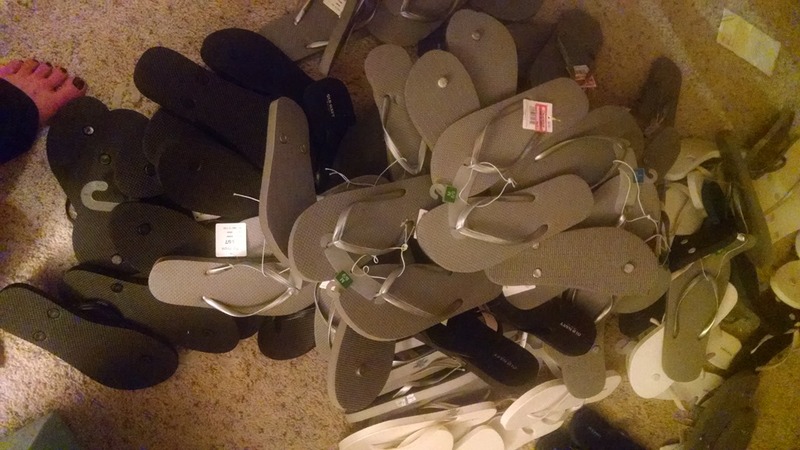 Eventually, I put everyone to work prepping flip flops for the dance floor bins. As always, we stayed up WAY too late and drank WAY too much wine. So everyone was more than pleased to start their Sunday with a frothy espresso! After breakfast, we attacked Home Goods with enthusiasm filling our cart with fall décor and household goodies. We had a few other shopping stops before settling onto a bench in the afternoon with well deserved full bowls of fro yo. By afternoon, everyone parted ways and I got myself to work around the house while listening to the Bears game. I took a huge zucchini from a coworker’s garden last week and promised to return with bread. Sadly, he wasn’t looking so good. Since I was still in the mood to bake, I switched over to pumpkin bread. I mean, it is officially fall! This bread baked up perfectly, turning out moist and delicious! It was a nice end to my busy weekend cleaning up the house with the windows open and the smells of fall flowing throughout. And surrounding myself with the support of my friends and family! 1 Preheat your oven to 350°F (180°C). In a large bowl, whisk together the flour, salt, sugar, baking soda, ground ginger, cinnamon, nutmeg, and allspice. 2 In a separate bowl mix together the pumpkin purée, the melted butter, beaten eggs, 1/4 cup of water, and molasses. Add the dry ingredients to the wet ingredients and stir until just combined and there is no more dry flour in the batter. Do not overmix! If adding chopped pecans or walnuts, stir them in. 3 Butter the insides of an 8 x 4 x 3 -inch loaf pan. Pour the batter into the loaf pan and smooth the top. Put in the middle rack of the oven. Bake for 45 to 60 minutes or until a tester poked in the center of the loaf comes out clean. Remove from oven and let cool in the pan for 5 minutes. Then run a blunt dinner knife around the edges of the pumpkin bread to gently separate it from the pan. Invert it to loosen it from the pan and put the loaf on a rack to cool completely. Good Evening Friends! How goes this short week? I left you with a cliff hanger which means that I owe you a recipe. I actually have a few as this post was sponsored by the letter Zee for Zucchini! I had 3 zucchini’s hanging in the fridge and now that my oven is fixed, it was time to bake up a quick bread. I stuck with the cookbook theme of Monday and whipped up this simple bread from Better Homes. Even after two loaves of bread, I had some leftover shredded zucchini that I thought would be perfect to add to one of my favorite breakfasts, the quinoa cake. I kept mine pretty plain and unsweetened, but you could definitely sweeten it up for a more decadent breakfast. The only thing I was missing that I wanted to add was walnuts. Then it would be a zuchhini bread bake : ) Zucchini also made an appearance in my most recent smoothie from the Detoxinista book! It’s got cashews, banana, zucchini, cinnamon, and flax…filling and fantastic! Zucchini Pineapple Bread *Blogger FAVE! What is your favorite Zucchini recipe? Link ‘em up! Preheat oven to 350 degrees F. Grease the bottom and 1/2 inch up sides of 2 loaf pans; set aside. In a large bowl stir together flour, cinnamon, salt, and baking powder. Make a well in center of flour mixture; set aside. In a medium bowl combine egg, sugar, shredded zucchini, oil, and vanilla. Add zucchini mixture all at once to flour mixture. Stir just until moistened (batter should be lumpy). Fold in nuts. Spoon batter into prepared pans. Bake for 50 to 55 minutes or until a wooden toothpick inserted near center comes out clean. Cool in pan on a wire rack for 10 minutes. Remove from pan. Cool completely on a wire rack. Wrap and store overnight before slicing. Optional: sugar, stevia, banana, maple syrup, or your favorite sweetener! Combine all ingredients in microwave safe bowl, sprayed with cooking spray. Stir to combine. Microwave on high for 3 minutes. Let cool slightly. Remove from bowl and top with nut butter, fruit, or maple syrup. It is feeling more and more like summer, which always puts me in a GREAT mood! And although I haven’t blogged about it, I’ve been busy! I had a highly successful week of exercise, including a Tuesday morning walk with the BOY and Thursday morning ab work after my run. 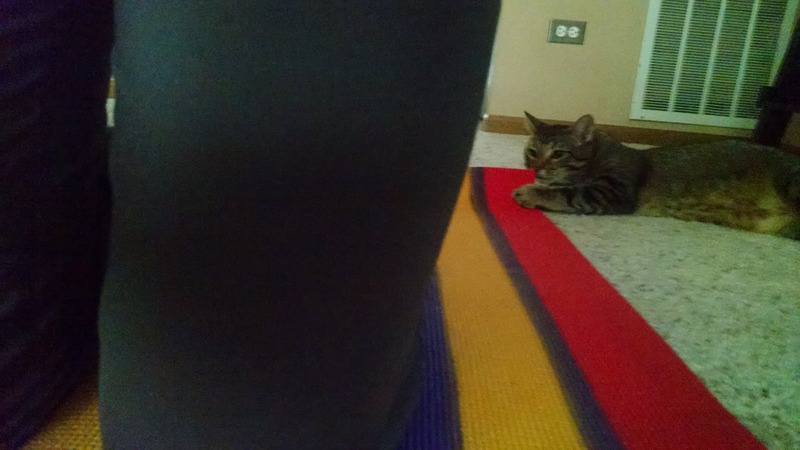 You’ll notice I had some competition for my yoga mat. 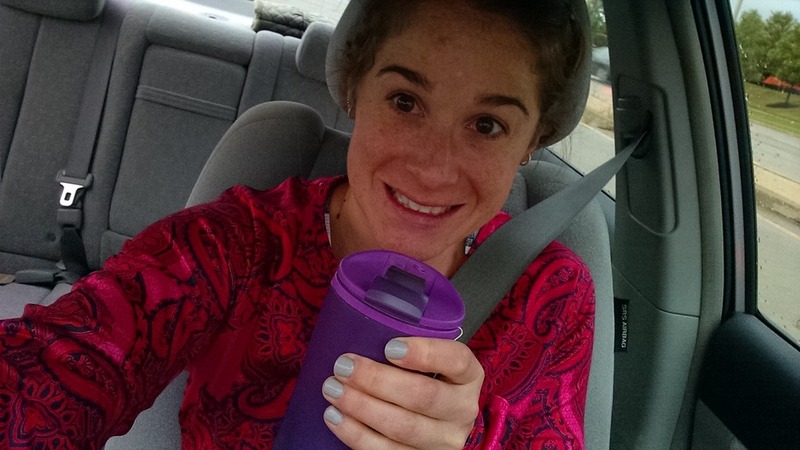 This morning, I was psyched to go to (instead of teach) yoga! It was a super humid class and we worked our way into birds of paradise. Note: using a block is helpful but you will not master this pose with wicked tight hips. Also note…you can still have a lot of fun with it. With the warm (almost) summer temps, brings crisp and delicious white wines. I indulged twice this week (two more times than my typical work week). Once during Wednesday night’s Hawks game with an awesome Cooper’s Hawk blend. And then again Thursday during sushi night! Summer is also accompanied by No Bake summer recipes and So You Think You Can Dance! Woo hoo! After yoga, I brought in Mediterranean for lunch and began watching the new season of SYTYCD as I worked my way through my never ending to do list. We are having friends over for a BBQ tonight and keeping our fingers crossed that the weather stays nice. 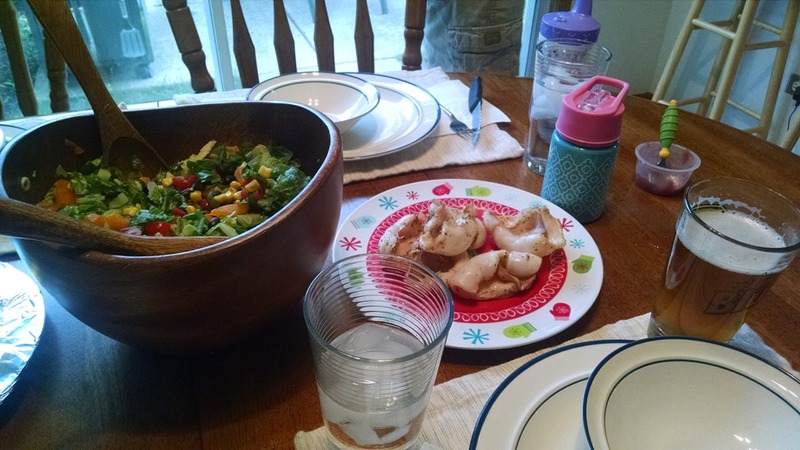 The BOY is grilling up shrimp and calamari…Mmm! I decided I wanted to make a tasty no bake dessert. 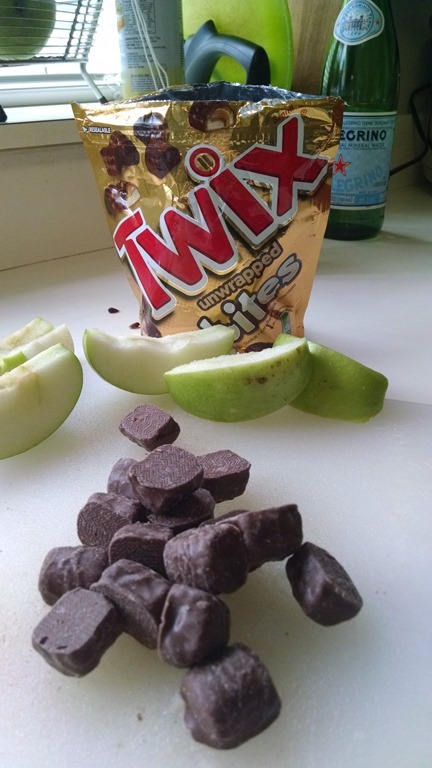 I settled on a Twix Caramel Apple Salad (from Pinterest)! I adjusted the recipe a bit because I had almond milk instead of dairy milk, but I think it is just as tasty. Cooper kept watch from his perch in the cabinet! Once dessert was settled in the fridge, I decided to make a banana bread with my brown bananas. As always, I went searching for a new recipe to try. I made a slight mistake…adding in lemon extract thinking it was almond. Oops! I was able to scoop the majority of it out. But although the plan was to freeze this bread for next weekend, I wanted to sneak a taste to make sure it wasn’t too lemony. Our BBQ was really fun! Our friends brought their almost 2 year old daughter and we were able to blow bubbles and draw with chalk outside before sitting down for some fantastic grilled seafood, roasted potatoes and savory salad. Dessert was a big hit too! And now it’s time to settle in and watch the Blackhawk’s game. The neighborhood is alive with energy, but unfortunately, I have a splitting headache, so I am missing out on the rest of the festivities. What do you like about summer Saturdays? 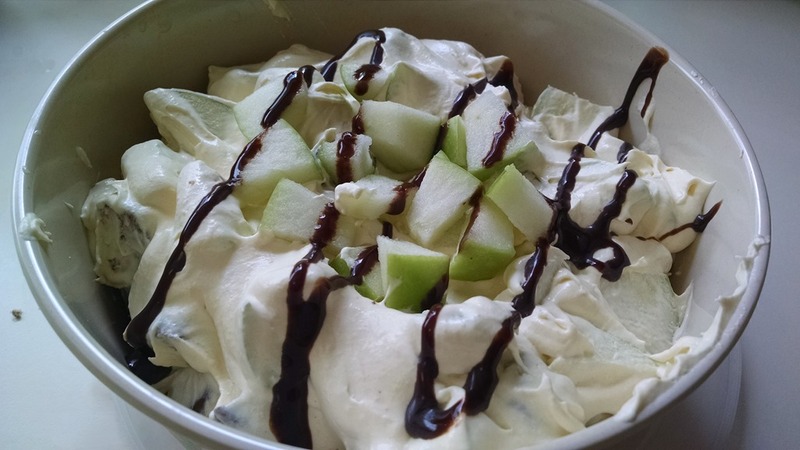 Whisk together milk and pudding and then immediately add the tub of whipping cream in it before it sets. Don’t use the full amount of milk as the box says. Dice the TWIX Bites into halves. Dice the Granny Smith apples. Stir them into the pudding mixture, and mix all the ingredients together. Allow it to set in the refrigerator for at least 30 minutes. Optional: Drizzle with Caramel or Chocolate sauce before serving it. Whisk together the flour, baking soda, salt, and cinnamon in a medium bowl. Place the sugar and butter in a large bowl, and beat with a mixer at medium speed until well blended (about 1 minute). Add the eggs, 1 at a time, beating well after each addition. Add the banana, yogurt, vanilla extract, vanilla bean paste, and almond extract; beat until blended. Add the flour mixture; beat at low speed just until moist. Spoon batter into an 8½ x 4½-inch loaf pan coated with cooking spray. Bake for 1 hour or until a wooden pick inserted in center comes out clean. Cool 10 minutes in pan on a wire rack; remove from the pan and cool completely on a wire rack.